No injuries were reported. The cause is under investigation. 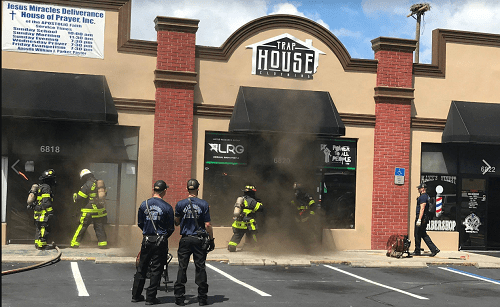 TAMPA – A strip shopping center sustained major damage during a fire Wednesday (April 10) that broke out in a convenience store, according to Hillsborough County Fire Rescue. No one was injured and the cause of the fire is under investigation. Firefighters said they were called to 6824 N. 50th St. about 11:26 a.m. When they arrived, firefighters found a strip shopping center with smoke pouring from the central store, Mike’s Food Store. The smoke covered most of the adjacent stores as well – a clothing store, printing place, barber shop and church. Because the stores were all connected, firefighters called for backup. They had the primary fire under control in 20 minutes. Crews also broke through or opened all the other attached stores to clear out the smoke that had penetrated. Firefighters said there is major damage to the structure itself including the roof. Code enforcement will be inspecting for danger. Photos courtesy of Hillsborough County Fire Rescue.